Yesterday I did something I had been thinking about for the past several weeks. I ran home from work. The shortest route I could find was just a hair over 20 miles. Not a bad way to get home. The tough part was getting up at 04:00 and heading out the door to run back the next morning! Except for some icy conditions in some areas, the running wasn’t too bad. I took it nice and slow, and enjoyed running in the dark. I saw one shooting star. I’ll probably try to incorporate this routine into my training on a more regular basis. I’m just blown away that I pulled this off in the beginning of January! 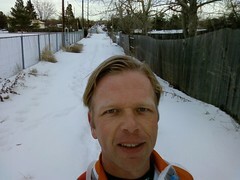 Posted on January 4, 2008, in run, training. Bookmark the permalink. Leave a comment.